Contact Hard Water Sports for Private and Small Group Ice Climbing Lessons. Minnesota Ice Climbing Guide – contact Hard Water Sports for your next adventure. Hard Water Sports will custom fit a Minnesota ice climbing lesson to your climbing level. We reenforce safe climbing practices while introducing the skills for ice climbing. Crampons, efficient kicking and stances. Tricks to staying warm and comfortable. 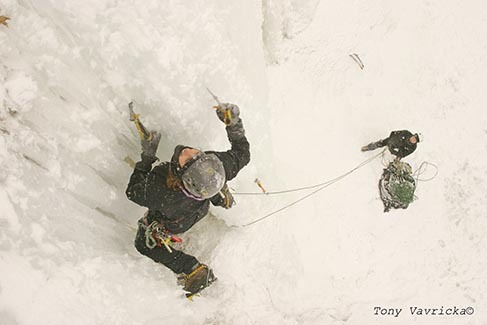 The Minnesota ice climbing season doesn’t last long, call today to get information about classes and private Minnesota ice climbing guides. Our guide service is located right in Sandstone, Minnesota – just minutes from the Ice Park. We can provide complete outfitting and guided adventures for solo climbers and small groups. Looking to give the sport of ice climbing a try ? A guide from hard Water Sports can get this adventure started. We know how to provide a safe and fun climbing adventure, give us a call for your next adventure. Ice climbing gear rental available right in downtown Sandstone from Hard Water Sports – Ice Climbing Gear Rental We have recently adding ice climbing gear to our rental department including; Black Diamond crampons, Grivel crampons, Petzl Nomic ice axes, Grivel Monster ice tools, boots from Vasque and La Sportiva. 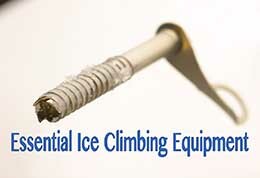 Check out the list below for the gear you need for your next ice climbing adventure. crampons, attach to boots, front points for kicking into ice and bottom points for stepping on ice ledges. Ice Climbing Gear Rental Hard Water Sports has ice climbing gear available for daily rental; crampons, ice tools, mountaineering boots.